What is the dish you are most famous for? Ma po tofu, a very traditional Sichuanese dish, which is a stir-fry with beef or pork and tofu with a broad bean paste, and sometimes MSG. We forgo the MSG and instead draw out deeper flavors by slow cooking ground pork and pork shoulder in between layers of seaweed, which contains high levels of glutamic acid. We braise it in wine, beer and a paste made from fava beans and chile that’s fermented for a year. The Salvador Dalí cookbook, called Les Diners de Gala. The photographer Todd Selby introduced me to it. It’s a big, gold cookbook with very old-school classic French recipes, like lobsters glazed in aspic. It was one of the first things I bought when I came to New York; I got it at Kitchen Arts and Letters. What is one technique everyone should know? Steaming, which I think is really underrated. The thing about braising is you need a lot of liquid and fat, but my palate’s changed so much and I don’t want to eat all that fat anymore, so steaming is important. I love steaming an egg custard, dumplings, even a piece of fresh halibut. To steam an egg custard, start by creating a very light but flavorful stock, using seaweed or clams. Combine the stock with beaten eggs, white soy sauce and Shaoxing wine, layer in bits of seafood or duck, and then gently steam until it’s just cooked, kind of like a savory panna cotta. Seaweed and fish sauce, because they have natural umami and really boost flavor. For fish sauce, I like the Three Crabs brand for cooking and Squid brand to use as a condiment. What is the best bang-for-the-buck food trip? Japan, where it’s very difficult to eat poorly. The attention to detail is in every dish, and it doesn’t matter if you’re at high-end sushi restaurant or a soba counter or a convenience store. The best thing for your buck is if you go to Osaka and have teppanyaki, which is a Japanese omelet with an egg batter, squid and seafood. It’s cooked on the griddle, and the inside isn’t fully set, so it’s rich, amazing and custardy. What is your dream restaurant project? It would be a completely charitable restaurant subsidized by the government. A lot of the food that’s subsidized by the government is really bad for you, so it would be great to serve food that’s healthy for the environment and the people eating it. I grew up in Oklahoma and ate a lot of canned vegetables and never had anything like fresh asparagus. We have the resources and should be feeding our kids something besides McDonald’s. Where would you take Thomas Keller, Tony Bourdain and Mario Batali out to eat? I’d take them to Sukiyabashi Jiro in Tokyo. This guy is 80 and has been making sushi like this his whole life, he didn’t take a break to go try regional Italian for a while. Plus the meal is quick, so I wouldn’t be totally freaked out by sitting with these famous chefs. It’s a 27-minute experience, and it is crazy, because it costs $600, but every bite is the best thing you’ve ever had. The bonito, the skipjack grilled over fast-burning hay, and the squid are amazing. The meal I had there still haunts me. Vegetables, restorative broth and diet food. I’m really tired of eating, and I’m afraid of getting gout. I’ve been doing a lot of traveling lately, meeting other cooks, and of course they want you to eat. The way that we’ve been eating in the past five years, and the obsession with pork belly is so unhealthy. I’m a walking contradiction because I talk about how great sushi is, but it’s the least sustainable thing. I love making broth with vegetables, or a nice duck broth with ducks’ necks and heads. I’ll simmer it, covered, for a long time and then take a ton of watercress, drop it in, cover it with fish sauce, olive oil and salt. After that braises, you have this nutrient-dense broth. Or I’ll make pot likker soup, which is from the South: You cook a big batch of greens and all the liquid left over you serve as a soup. There’s not any fat, or just a little, and it’s really clean. What do you eat from the fridge, standing up? Like most cooks, I don’t want to eat what I make at work, so I’ll order from whatever delivery menu is on my doorstep. I go to Spicy Village in Chinatown a lot, but I’ll also eat the worst takeout in the world. It doesn’t matter. The best leftovers are crappy sweet and sour pork, fried rice, or Korean hand-pulled black bean noodles with cuttlefish and pork, and a sweet and sour beef with pineapple and peas. Why He’s Amazing Because he converted an ultrapopular taco truck’s loyal following into fans of his proudly experimental take on Chinese food in San Francisco—and now devotees wait hours for a spot at his New York City outpost. 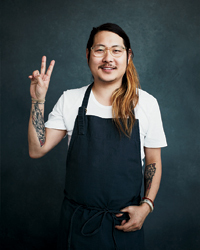 How He Describes His Cooking “Americanized Oriental food,” played out in dishes like his supersmoky kung pao pastrami. Italian Cred The Korean-American Bowien once won the World Pesto Championship in Italy, beating out 100 other finalists, 80 of whom were from Liguria, where pesto was born. Giving Back Only one dish at Mission Chinese Food costs more than $16, and 75 cents from each entrée sold goes to a local food bank. Aspiration In the next five years, he’d like to open restaurants in locations as diverse as Paris, Brooklyn and Oklahoma City—his hometown.